Well up until yesterday, I barely knew Carrara existed. Sure I had seen the name and occassionaly a product advertised but that was about it. But thanks to HowieFarkes products and some very kind people in another thread that I kind of unintentionally hi-jacked (really sorry about that), I plunged forward and bought Carrara yesterday and did my first render last night. So with suggestions from the other thread, I have everything installed and setup. It was pretty easy really. Tonight my goal was to load an object into the scene and then try a render, a hot air balloon specifically. Well I loaded the object but didn't see where it was and then had trouble moving around the scene. LOL. ok so that part didn't go as smoothly as installing. I saw some vids on Learning Carrara in the store and watched some samples off the website so I think I will purchase them to help me get up to speed. To me just getting something rendered that looks good was great and I didn't have to do anything except load the scene and click render. so what was the question??? Congrats on being a Carrara owner. Handy hint:: edit your preferences with regards to keyboard shortcuts. I have my numerical zero hooked up to "view selection" and the njumber three hooked up to "director's camera"
Using the director's camera is very handy, as i t doen't get involved in your "edit undo list"
so eg when you lose something, select it in the instanced drop down list (that thing on the bottiom right, then hit "3"
Welcome aboard! For starters, have a little peak inside the Carrara Information Manual, follow some links to and fro, pay a visit to the samples of those video tutorials at the Daz3d store in there, Have a walk through the Cripeman video tutorial index (free video tutorials) as well as many other helpful links and fun stuff. Above all else, have fun in the exciting world of Carrara! when learning a new program I always find that thse simple things are left out of tuts, because the chap giving the tut has assumes "x" amount of knowledge. Hahah...not really a question as just some observations so far. I've never been much of a shortcut person but I am willing to try. I watched a vid for like 5 minutes and can find my way around. I found my balloon by going to the top and left view. (now that I know where they are). I'll definitely check out the shortcuts. Thanks. Thanks. Some really good advice there. I've been looking at some renders already. I really like renders because it gives me a good idea of what the program is capable of. I'm about 1/2 through the "Post Your Renders" thread. I'll check out the links too. One other source you can get to help learn Carrara is the book Carrara 5 Pro Handbook by Mike de la Flor. While it is for an earlier version all the info in it can be applied to Carrara. If you get a copy make sure it has the disk that comes with it, as that has files you'll need. Also as was mentioned, Cripeman and others have many good free video tutorials online. ShareCG has a few free PDF tutorials too. Thanks! I'll see if I can get a copy. I've made a vow to really concentrate and learn 3d stuff this year and so far other than lighting and not always being able to get a hold of good tutorials, it's been fun. And with Studio nothing ever looked as good as I imagined and that's why I'm excited by Carrara because I really like outdoor scenes and they look good when I render them so far. Now when I try some stuff on my own lol that'll be a different story but until then I'll have some eye pleasing samples. Okay now go have some fun! when you're moving around in Carrara,. the camera uses the "selected object" as the Axis of rotation. You can use ALT and CTRL plus click and drag the mouse in the work area to move the camera instead of selecting the tool from the tool-bar on the left. If you "Drag 'n' Drop items from the browser,.. directly into the scene,. then their placement can be variable depending on when you drop the object,.. If you loose focus on you object,. or you want to move the camera to that object,. press 0 (zero) on the keyboard to "Focus" the camera on that object,. this can also be used to move around the scene, zoom in and out etc. some helpful pages to get you going. One of my favorites, when that doesn't work, is one that Head Wax mentions, but you don't have to set it up i advance, is to select an object and hit "0" (zero, not shift o), which zooms your view to the object. Another that he mentioned that I also find to be crucial, and you really never hear anyone mention it, is using the Directors Camera. The spiffy part of this baby is that it cannot be animated. So when you're working on an animation, you're not setting keyframes. But even if you're working on a still picture, moving a normal camera uses an 'undo' slot. if you zoom with the mouse wheel, each increment can be undone. This can use up all of your undo's in a hurry. The Director's Camera cannot be keyframed, so its movements, pans and zooms cannot be undone - leaving your undo buffer free for your 3d work. Sweet thing to remember. I think part of the problem with last night is that since it was a premade scene I didn't want to move around much because I didn't want to mess up the "shot". Normally in studio I would create another camera or use perspective view to move objects. Last night I was just too overwhelmed with the newness of the software to determine what I could do and how. Tonight I'm going to work on putting objects in the scene. I consider last night a success. Thanks for the tips. The directors camera sounds like what I need to use to move and place objects. So now I know where to change those I'll see about trying that perspective tonight. I'll also focus on just moving around and switching views to get more comfortable. I started watching the training vids and that will help. Overall it doesn't seem as bad as I feared it would be. I just need to get familiar with the interface and then out some scenes together. I didn’t want to move around much because I didn’t want to mess up the “shot”. In Carrara,. you can create multiple camera's from the INSERT menu , and (in the camera options pop-up menu) you can save several different camera "positions" with a name, so you can load that position again, or create another camera and load that saved position. 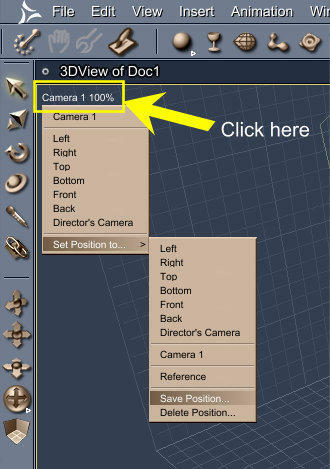 You can also create a "Target Helper Object" (the equivalent of a NULL object in DS) then you can select your Camera,. go to the (Modifiers) tab in the top right hand panels, and select "Point at" ... then select the new target helper object you created, (or any other object in the scene) from the list. Now when you move the camera, it'll always point at that selected object. I tried some things last night. I added 3 hot air balloons to country roads 2, I believe that is the name. I need to add a couple of cars and some people or at least try. For some reason I'm not finding how to add cameras on the insert menu. On studio it was just new camera easy peasy. I'm sure it's easy this way too. I'm just not seeing it. I started watching some training vids last night but fell asleep lol. The insert menu has a lot of stuff in there, but I still prefer it to other methods - perhaps habit? The video's you're watching, are those the one's sold here, by Infinite Skills with the instructor Phil Wilkes? I have the Advanced Techniques set and just love it! It's so enjoyable to me that I'm going to buy the Learning Carrara set as well, just for more great TV programming to watch! I wonder if I could buy Mark Bremmer's stuff from VTS by file, rather than having to stream from a membership. I'll have to look into that. But Cripeman is another great learn, is free, and highly entertaining. My other favorite TV is for another software sold at Daz3d called Project Dogwaffle, a post work application. I even made comprehensive playlists of the various episodes[/ur]! Most of those videos are condicted by its developer, Philip Staigerman, a big Carrara fan and user, who also used to work on Carrara starting with version 2! He, too, is highly entertaining. I'll never have to watch regular TV again! Well that makes all the sense in the world. I'll try the copy/paste tonight. That sounds easy enough. Ok lol I'll try not to think in terms if studio. Yes the vids are the ones that are sold in the store. I bought both the Learning one as well as the advanced and I really learn a lot in just a few minutes. Last night I was so tired. I need to watch them earlier in the day. Hmmm you know I've never done post work. Oh I take that back. I did add rain to a picture one time but that's about the extent if it. Oh, oh and also as far as I'm using Carrara now. I see some things are so much easier such as duplicating objects and having a lot of objects amount other things. I really like it already. I don't use the insert for cameras, I just select and click in scene. Where the camera comes in has nothing to do with where I click, so often I have to send to origin; edit menu. Or it is simple enough to just duplicate the camera you are using and change it's name. 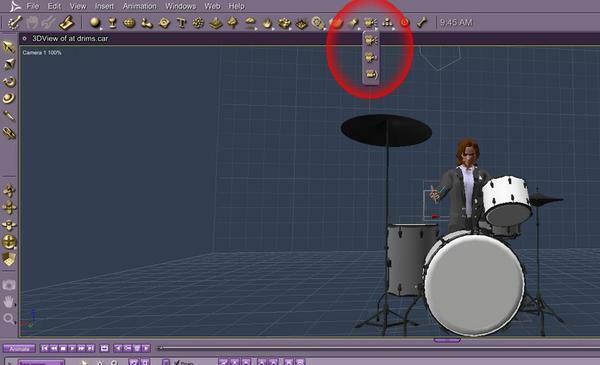 Duplicating is as simple as selecting the camera in the scene tree, right click, select duplicate. Note: For duplicating an object multiple times ctrl+D is your friend ;) I use it for physics objects and light banks. Well then you've come to the right App. I rarely ever do Postwork. Finally, one day, I decided to look into Project Dogwaffle, remembering that I've seen it in passing as I was looking for various apps here in the store. I also remembered that it held a pretty small price tag - so I thought I'd check it out. Well, after checking out their official site, and started milling around, looking at various features and versions available and so on... I decided that if any of them would be right for me, it would be PD Pro: Howler, which is their flagship version that allows for importing avi or sequenced image files, and exporting to either as well, once you're through. Well that sounds handy, since I've often wanted to make post work magical effects and such or, perhaps rain, etc., and I've always been one to render animations. Very few stills, unless I want to show somebody something or post to the renders thread. After watching a few videos, I had to buy it. Even if I never get the chance to actually play around in it, at least I supported the cause for those super-awesome videos! First of all, did you know about the"My" folders in the browser? Those go to folders in your "My Documents > Daz 3d > Carrara 8 > My Presets" folder, and you can go in there and add new folders and folder structures to create an awesome catalog system within your browser to which you can save your files. Well, in the My Objects spot in the Objects tab of the browser (before entering my cool folder structure), I have some generic scenes saved there with my usual preferred defaults set up. For example, whenever I go to my Objects tab, without touching another folder, I have a few scene to select from right along the top ("My" folders within the structure are located on the top). The first of which is called "1280 x 720 Blank", which is just that: A blank, empty scene with the default camera 1 and Light in there, plus a Scene Cam (I just copied Cam 1 and zoomed back and aimed it better) and have my default render setting for scene setup, including the file format that I want to use - everything I can set to the way I normally want to use Carrara. I also have scenes saved like this with lighting rigs that I like saved into them, but nothing else. I have a "Vehicles" folder, "Light Rigs" folder, my "Scenes" folder (within Objects, because - for some reason, the Scenes tab does function this same way - so I use my Objects folder instead) is broken down into many specific, and not-so-specific categories to help me keep all of my saved scenes handy. I structure these folders in a way in which I would look for them if I forgot where I put them - so nothing is ever lost. This is one of my favorite things about Carrara's browser! My main characters are even saved with their own, specific 'highlighting' light rigs and cameras set to dramatic angles so they load with them every time I need them - this keeps everything consistent from one animated shot to the next without hassle. Of course I had to tweak the light rigs to work well with my other light rigs, which took a bit of tweaking during casual play times, which is incredibly fun. I make sure that my global lighting rigs work for whole scenes, while the specific character highlight rigs (I set each light to affect only the character who owns the rig, which is stored conveniently within a group, which is named for that character) are set to work properly for most situations within those rigs. Sometimes they might need a tweak, or even be shut off - depending on the shot. Well I ge overwhelmed easy but I've learned to break everything down step by step and its not nearly so bad. I've always liked the thought of animation and movies and such. The reason I got into all of this in the first place was to have some visual for the novels and stories I write. An I so desperately need to get organized. Under studio I have 40 charaters. I have 10 men, 10 women, etc. I like to have all ages, races, etc. I like variety but I'm not organized. Most of the time it takes longer to find something I'm looking for than to set up the scene itself. With Carrara I haven't tried people yet. I could do that tonight maybe with my pond scene, just send a couple of people swimming. Bad thing is I use mainly genesis so I have lots that way but I could pull out ole Vickie and Michael. I just don't have a variety of characters and ages. Anyway there is lot to learn but it's fun and relaxing once I get past a few learning issues. I think since Carrara does outdoor so well I want to do my big camping scene. I'll learn a lot about how Carrara works by doing that. I'm big on learning by project and example rather than theory. That in mind, the Working with Content article in that "Carrara Information Manual" is a great, not too long, place to start, especially when it come to what's compatible, and what's not, and shaders. Definitely grab the free shaders tutorials linked in there. Indigone's Shader tutorials are excellent at getting your people to look just right. And the article mentioned above links you to them, and if you don't want to wait for the Subsurface Scattering process during renders, simply turn that off in the shaders - you'll see what I mean hen you get that far. Something that I don't ever recall anyone mentioning on these forums, ever, but I thought was an amazing Carrara learning set is Lynda.com's Carrara 5 Essential Learning set - Instructor Jack Whitney, who covers the software in great detail. It's version 5 back before Daz3d took it over, but everything he teaches is still relevant because stuff was added to Carrara, not taken away. One thing is that he shows the new, higher resolutions available in the assembly room, which is almost laughably less than what is available today. You have the Infinite Skills complete set, so You should be pretty well covered on that stuff, I was mentioning it here in case someone else, reading the thread is looking for options. Also, if you're like me and despise television shows, you may just want something interesting to watch instead. It's amazing how much enjoyment I get from watching tutorials regarding stuff that I already know, just for the sake of having something to watch! I tell ya, I live the Carrara life - I love it! Well it is super easy for me not to watch television. My apartment was broken into twice and I vowed not to buy another tv until I move which I am working on but I haven't had a tv in 2 years now and to tell you the truth I don't miss it. As long as I can keep ahead of my frustrations 3d stuff is far more engaging . It's amazing how fast the time goes. Today at lunch I took a premade from Howie and played around to see what objects I could get in. As far as people I tried Sadie and Sam. They came up first on the list in order. I did a render, rather plastic but again the goal was to put something in the scene so it was a success as far as I'm concerned. I have a dinner with my uncle tonight but will work on some stuff this weekend. I want to try and finish setting up the balloon scene if I can. So far I have the balloons on and it looks pretty good. I don't have Sam & Sadie, except for the Genesis version, but you are going to have to adjust the sharers with some content so the look good. This has been discussed in a few posts. Thanks. Yeah I do a lot of searching. I'm used answering my own questions for the most part. In computer stuff I'm usually the goto guy. I just don't know graphics much. Once that's done, select the "Model" of one figure and enter the Texture Room (paint brush icon upper right interface) and choose "Edit" the master instead of new. Anyways, I came in to tell you (and others) that I began to work on the Carrara Walkthrough in the Carrara Information Manual. For starters, I decided to teach you what you should need to know about Your Carrara Browser. Although incomplete, it covers the basic idea that I'd like everybody to know about the power of structure when saving into your browser. As soon as possible I'll get to work on getting good tidbits like that completed for the rest of the walkthrough to give everybody a good, basic introduction to the magic I know as Carrara! Take care. Sorry to her about those break ins. Well I didn't do as much today as I intended but I needed to give my mind a break too. I did read through about folder organization and checked out a number of the links including some demo reels of your animation sequences and so forth which was pretty cool. I've also fancied the idea of being able to make my novels into some sort of movie but then again everything is pie in the sky dreaming but dreaming helps us get through life right? Anyway, I did some of that and then hung out with some of my "NPC's" today mainly in Skyrim. It helped to get immersed in that for a while and let my mind rest. Well, when your mind is ready for more, I've just made a major update to The ►►► Carrara Information Manual ◄◄◄, mainly by beginning work on my Carrara Walkthrough, which still has a long way to go, but at least it can help get some folks started in Carrara. I've just done a pile of link updates when, all of a sudden, one of Carrara's Daz3d Published Artists makes a new post with a valuable giveaway freebie product: Lighting presets for artists and dummies, by magaremoto - who is just awesome! So off I am to add a link to that in there too! oh wow very cool. Tomorrow I'll work on stuff more. Tonight I'm playing around some with StoneMason's Cryo Environment. That gives me lots of ideas lol. I'm trying to set up a fast render, well not fast rendering but setting up a scene and then going to bed. Looks like it will take a while to render and it pings my cpu out to 100%. My computer seems so slow. I'm always waiting and waiting...Hurry up and wait is the motto.